Station buildings and platforms demolished. The station cottages, located between the railway bridge and station approach road, are in residential use. Notes: Most of the stations between Newcastle and Berwick were some distance from the villages that they claimed to serve, or they stood in lonely countryside with only a scattering of hamlets or farmsteads. Longhoughton station, however, was within a few minutes’ walk of the village. 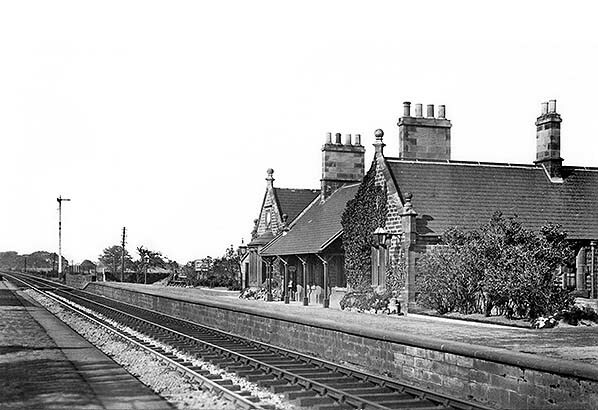 The station opened with the line in 1847 and was provided with one of the elegant and generously proportioned Gothic Tudor/Jacobean (‘Jacobethan’) buildings in sandstone ashlar, designed by Benjamin Green for the Newcastle & Berwick Railway Company. Longhoughton station was unusual in that the design was adapted to serve platforms on an embankment, so the two-storey building presented only the upper floor at platform level. A similar situation obtained at Warkworth, but here a more expensive edifice was provided with the two-storey building, perched on a basement, facing the platform. The building at Longhoughton cost £1,101 to construct, as opposed to £1,649 spent at Warkworth. Further south on the main line, the later station at Annitsford (1878), like Longhoughton, had a two-storey building with only the upper storey visible at platform level. On the platform (western) elevation of Longhoughton’s building a pair of gables – single-storey, as intimated above - clasped a pent-roofed verandah between them, supported on square cast iron posts and fretted brackets. The verandah extended slightly forward of the building. A canted bay window was provided on the northern gable, and both gables were embellished with recesses above the windows. Offices and waiting accommodation were located in this upper storey. A flight of external steps to the north of the building led up to the platform. 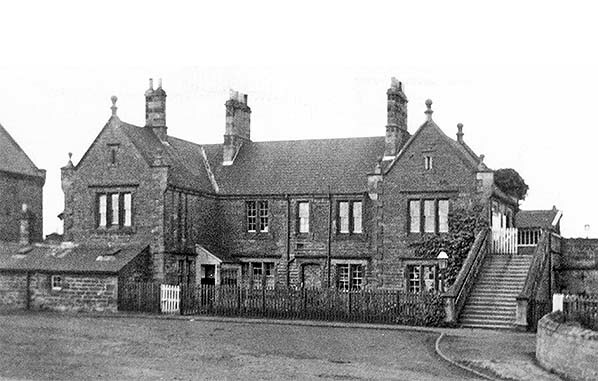 The pair of substantial gables was repeated on the two-storey frontage, standing forward and facing the forecourt. Living accommodation was in the lower storey, some of it backing onto the embankment. The Welsh slate roof was given the customary N&B accompaniment of raised gables and kneelers, all decorated with ball finials, and some tall chimneystacks. Fawcett (in Addyman [Ed] 2011) opines that the building at Longhoughton was visually less effective than that at Warkworth in serving the elevated tracks. On the down (west) platform a pent-roofed stone waiting shed was provided by the Newcastle & Berwick Railway, the roof sloping down from the rear wall towards the front of the platform. To afford passengers greater comfort the formerly open front was enclosed with timber and glazing by the North Eastern Railway. Longhoughton’s goods facilities were immediately south and east of the up passenger platform, served by five sidings all entered from the south. One entered the goods warehouse, described below, with two parallel sidings immediately east. Two more sidings were further east, terminating in a goods dock. The goods warehouse, immediately south of the main building, was a dominant feature of the up passenger platform. Its roof extended a full storey’s height above the station building whose architecture it complemented with its steeply pitched roof, raised gables and ball finials. The ridge of the warehouse was transverse to the platform, and the gable overlooking the platform had two blind windows high up on the wall. A siding entered the warehouse through a large semi-circular arched opening. The corner of the building between this opening and the platform was buttressed. The original signal box, opened in 1873/74, was an unusual stone lean-to structure on the up platform abutting the goods warehouse; it housed a 12-lever frame. It was decommissioned on 18 July 1909 and replaced with a brick-built N4-design box south of the down platform, with a commanding view of the sidings. The new box was fitted with a Stevens 25-lever frame which was in place until 1960. By 1897 a pair of cottages was provided for railway staff on Station Road, immediately east of the railway overbridge at the junction with the station approach road. From the outset the single word spelling of the village name was adopted by the railway, rather than ‘Long Houghton’, the version used on the earliest Ordnance Survey maps. Reid’s Monthly Timetable of May 1849 shows southbound departures from Longhoughton to Newcastle at 8.24am, 11.54am and 6.36pm on weekdays and 8.11am and 6.27pm on Sunday. Trains departed for Berwick on weekdays at 8.35am, 3.11pm, 5.21pm and 8.20pm, and on Sundays at 8.47am and 7.46pm. The trains which called at Longhoughton stopped at every station between Newcastle and Berwick. In February 1863 Bradshaw shows southbound trains to Newcastle departing at 7.25am, 1.00pm and 6.34pm on weekdays and one Sunday departure at 7.32am. Trains left for Berwick at 10.46am, 3.06pm and 8.18pm on weekdays and 8.05pm on Sunday. The RCH Handbook of stations 1904 indicates that Longhoughton handled the full normal range of goods traffic and that a 1 ton 10cwt crane was installed. Nine years later NER statistics showed that the principal goods handled were roadstone and building stone and 143 vans of livestock were dispatched. The source of the roadstone despatched here and further north at Belford station was the outcrop of igneous rock known as whinstone, which forms a series of cliffs across Northumberland, on which Hadrian’s Wall and the coastal castles at Bamburgh and Dunstanburgh stand, and of which the Farne Islands are formed. The nearby Longhoughton and Ratcheugh quarries yielded the whinstone; Longhoughton quarry provided limestone as well. In 1911 Longhoughton station served a population of 796 and 6,107 tickets were issued. In winter 1912-13 the North Eastern Railway timetable advertised the following service from Longhoughton. It will be seen that several southbound trains reversed at Alnmouth, the next station south from Longhoughton, and ended their journey at Alnwick. If passengers from Longhoughton were travelling to destinations south of Alnmouth, they could change at Alnmouth and join a conveniently timed Alnwick-Newcastle service. The first northbound departure of the day is shown to run as far as Beal; this train waited at Beal for about half-an-hour, shunting off the main line to enable a northbound express to call, before completing its journey to Berwick. Passengers on the 9.48am ex-Longhoughton could change at Belford or Beal to catch this faster train to Berwick and onward to Edinburgh. By 1920 the NER had discontinued the practice of running through trains from Berwick to Alnwick, reversing at Alnmouth. For passengers from Longhoughton, the short journey to the local shopping and employment centre of Alnwick, about three miles away, now required a change of trains at Alnmouth . 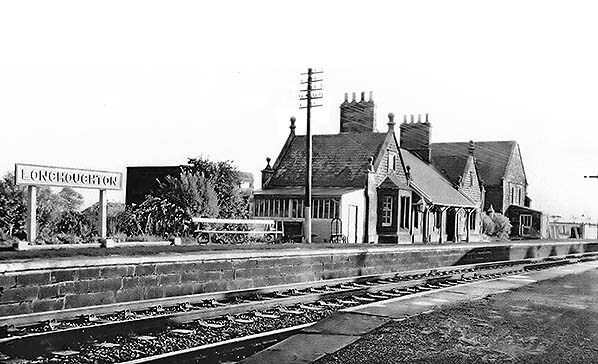 If they missed their connection the presence of a refreshment room at Alnmouth station (which catered for passengers’ needs until 1952/53) would have offered some comfort. Motor buses, on the other hand, provided a direct – and probably cheaper – journey to and from Alnwick taking between 5 and 15 minutes, and in summer 1931 Bolton Bros provided six journeys to Alnwick and five back. One train in the above timetable is shown as running through to Alnwick. The morning train advertised as terminating at Beal was a particularly durable feature of the timetable having been seen in the 1912-13 departures. The afternoon train shown as working to Christon Bank continued to Berwick after 17 minutes, allowing a northbound fast train to pass. Presumably it was advertised as a different train for the remainder of its journey as passengers would not officially be permitted to stay on board when it was moved off the main line during its rest-over at Christon Bank. The timetable shows this train to be one class only, so it was presumably a steam railcar or a push-and-pull, which would have made the manoeuvres at Christon Bank straightforward. During World War I (1914-18) many lightly-used stations had closed, some never to reopen. 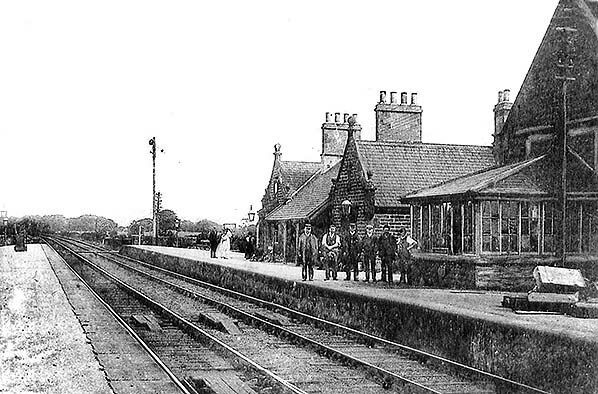 Closures in World War II were rare, but between Alnmouth and Berwick several stations, including Longhoughton, were closed to passengers, the service being withdrawn on 5 May 1941. It is likely that some unadvertised calls were made by trains at Longhoughton during the later years of hostilities for personnel based at the nearby Boulmer airfield. In 1940 this ‘decoy’ airfield was established two miles east of Longhoughton station, to divert German attacks from nearby RAF bases such as Acklington (close to another ECML station). When the danger of air attack abated Boulmer airfield closed, but it was reactivated in 1943 as an RAF training base; it closed once more with the end of hostilities. In the Cold War era the base reopened in 1950 and was developed for nuclear surveillance and interception purposes. An estate of about 200 units of family accommodation was added to Longhoughton village for RAF Boulmer personnel, probably doubling the village population which had been 550 in the census of 1951. 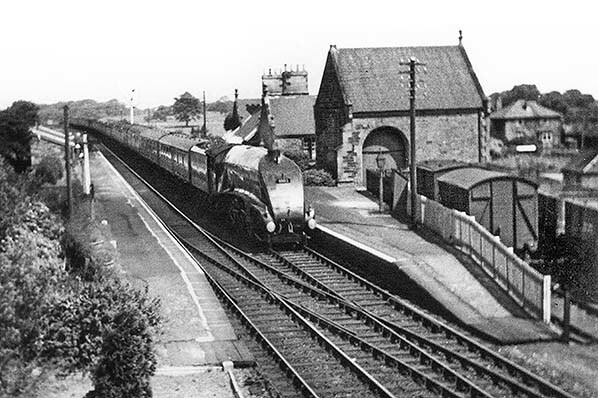 Only 159 tickets were sold at Longhoughton that year – the lowest figure for any of the Newcastle-Berwick stations - but the additional population would undoubtedly have increased the use of Longhoughton’s railway station by the late 1950s, although the RAF estate was built to the north of the old village – the opposite end from the station. Longhoughton station was administered by British Railways North Eastern Region from January 1948. In the early 1950s the train service from Longhoughton was sparse: the summer 1950 British Railways timetable showed only two weekday southbound departures to Newcastle at 8.21am and 5.56pm and two northbound, at 9.06am to Berwick and 5.26pm to Edinburgh, and no Sunday calls. However, whilst most of the minor stations between Newcastle and Berwick had suffered a marked reduction in their train service, the summer 1954 timetable advertised an increase in departures from Longhoughton with three up and four down on weekdays and one train each way called on Sunday. An interesting additional departure was on Monday only, when the 12.55am daily London Kings Cross to Edinburgh Waverley overnight express which called at Newcastle, Alnmouth and Berwick in Northumberland also made calls at Acklington (7.23am) and Longhoughton (7.41am) allowing personnel based at Acklington and Boulmer RAF bases to return from weekend leave. Although it had actually closed to all traffic, the summer 1962 BR(NE) timetable showed a ‘phantom’ train service for Longhoughton as in winter 1961-62 but with some re-timings. The following year the disused station sprang back to life for one day when a Whit Monday excursion on 3 June 1963 called, and one of the photographs seen below was taken that evening on the return trip to Newcastle. It is understood that this was the final train to serve Longhoughton. The signal box was decommissioned on 4 October 1964 and, together with the station platforms and buildings, it was demolished within several years. The goods dock, devoid of sidings, remained in place until the early 1970s. The station cottages still stand between the railway bridge and the station approach road. The station forecourt and yard have been used for storage by the Aln Valley Railway. This enterprise is working towards the restoration of the railway link between Alnmouth and Alnwick, which lost its passenger service in January 1968 and was subsequently dismantled. Looking north from the down platform at Longhoughton c1906. On the opposite platform the tall gable of the goods warehouse is seen on the extreme right. The lean-to structure with the hipped roof in front of the goods warehouse is the signal box which closed in 1909 when a new box opened south of the down platform. The main building beyond the signal box appears to be a single-storey structure, but because the platforms are on an embankment the building has a lower storey, as seen on a photograph (below) taken in the station forecourt. 1864 1: 2,500 OS map. The station is close to the western outskirts of Longhoughton village. The main station building is seen adjoining the east (up) platform, reached by a short approach road from the north. The goods sidings are immediately south and east of the passenger facilities, and one siding enters the goods warehouse (which is not named). The waiting shed is shown on the west (down) platform facing the station building. 1897 1: 2,500 OS map. Since the previous survey a signal box (‘SB’) has been added on the up platform, abutting the un-named goods warehouse, and a two cottages (semi-detached) have been built on Station Road, between the station approach road and the railway bridge. 1923 1: 2,500 OS map. In 1909 the signal box on the up east platform was closed and a new one built on the opposite side of the tracks, south of the down platform. ‘WM’ indicates a weighing machine in the goods yard. The station building at Longhoughton is viewed from the down platform, looking north c1910. The NER running-in nameboard can be seen on the up platform. John Henry Mansfield was a clerk at Longhoughton station but was promoted to stationmaster. 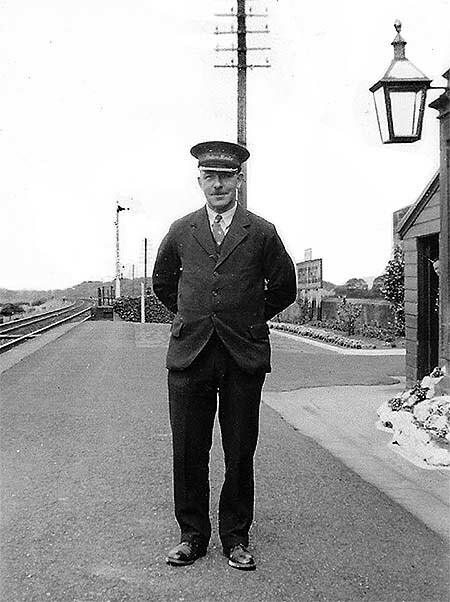 The date of this photograph is not known, but it will be from 1935 at the latest as he was appointed stationmaster at Little Mill (the next station north from Longhoughton) in that year. He is standing on the up platform. The NER lantern and running-in nameboard will be noted. Longhoughton station, looking south-east from the ramp of the down platform c1953. The upper storey of the station building contains the offices and waiting room. It is constructed of sandstone ashlar (Northumberland freestone) and is in the Gothic ‘Jacobethan’ style that was used for the original (1847) stations on the Newcastle & Berwick Railway. Beyond it is the goods warehouse, also of Gothic style; the lean-to structure in front of it was formerly the signal box. The running-in nameboard is typical of those installed by the LNER in North East England between 1923 and 1947. The bench is of the ‘coiled serpent’ design found at many NER stations, although such benches were also provided in many parks and on esplanades. The station garden has seen better days. Behind the bench the stone structure is the gents’ toilet. A timber and glass lean-to is at the head of the staircase from the forecourt.